Yoga as therapy for Parkinson’s disease? 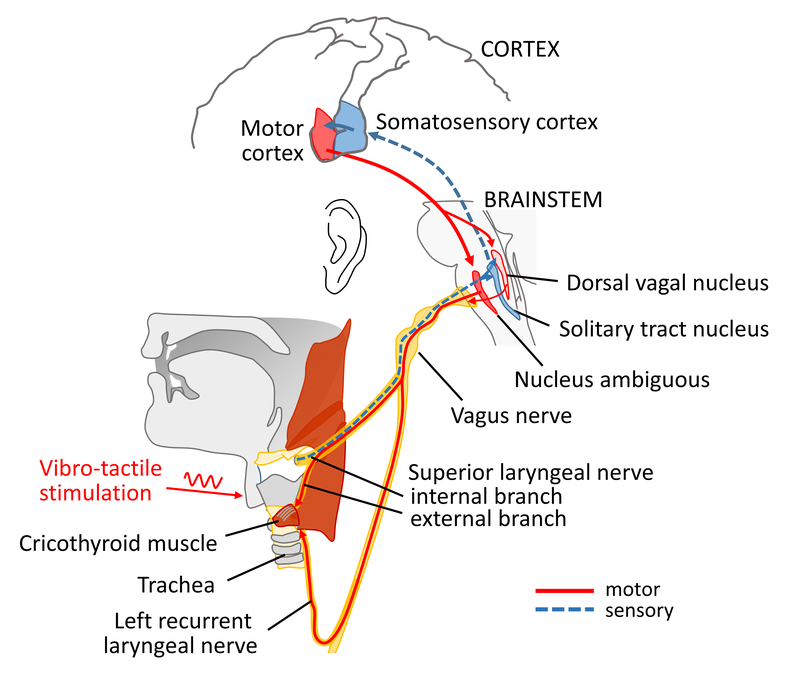 I’m curious as to any prior results to laryngeal vibro-tactile stimulation (VTS). Has this procedure been tested at all? We have obtained preliminary evidence that VTS can improve voice quality in people with SD. These data will be published soon. Is it thought that a single course of treatment could permanently resolve symptoms, or would I have to use the device on a permanent basis? We have data from 13 participants who received VTS in a single session. 62% of the participants responded to VTS and showed improved voice quality that lasted for a minimum of 20 minutes after receiving VTS. At this point, we do not have any longitudinal data to conclude, whether this treatment could result in permanent improvement or not. The current study will investigate the effects of 3-month long VTS treatment on voice quality in SD. Without getting too deep into a medical explanation, can you tell me how VTS is thought to be helpful with SD? A sensory trick - a tactile maneuver as simple as touching the neck - can alleviate abnormal dystonic neck spasms in cervical dystonia. 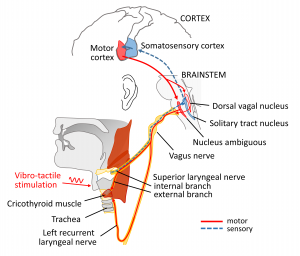 We have preliminary evidence that VTS can function like a "sensory trick" as it stimulates the mechanoreceptors in the skin and the muscles of the laryngeal area. The consent form mentions research-related injury. I’m assuming that’s just a formality to mention that in the consent form since prior to that it states that risks are minimal? The study risks are minimal, such as redness over the skin are where the vibrators are applied, as described in the consent form. We have tested over 15 people with SD so far, and we have no reason to believe that there are any risks associated with the procedure. The Human Research Protection Program of the University of Minnesota has reviewed the study and classified the vibrators as non-significant risk devices. When can I participate in the study? We are hoping to start testing participants by the end of February 2019. If you are interested in participation, please send an email to Dr. Naveen Elangovan (naveen@umn.edu) or call the laboratory (612-625-0107). How often do I have to travel? Will I get reimbursed for travel? We will pay for lodging for up to two nights. In addition, every participant will receive a stipend of $50 for meals per visit. Based on your home location and type of transportation, we will try to provide travel support, but cannot guarantee full reimbursement. You can discuss the details with the study coordinator. I have some personal commitments that will not let me participate in the study until later this year. Would I have missed eligibility to participate, if I chose to participate later this year? I receive Botox injection on regular intervals. Do I have to forego treatment to be eligible for study participation? You do not have to forego your Botox treatment to take part in the study. However, you will have to start your participation within 7-10 days before you receive your next Botox injection. In other words, the first visit to the laboratory should occur while your Botox levels are low or depleted. Would I be able to return home the day of or day after the lab visits? You will spend up to 4 hours in the lab during each of three in-lab sessions. You can get back home on the same day. How long do the in-home treatments take and how often? In-home sessions will last for half an hour on every treatment day. This includes 20 minutes of VTS, the vocalization of certain vowels, and the reading aloud of a set of sentences. Are the vibrators removed after each treatment or do they remain on the skin? The vibrators will be removed after each treatment. 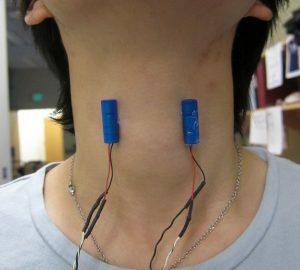 You will attach the vibrators using hypo-allergenic tape on the skin above your voice box (Adam's apple). You do not have to wear them all the time. If I participate in the study and receive good results with VTS, would I be able to keep the stimulator at the end of the study so that I could continue to use the device? You will have to return the equipment at the end of your treatment protocol. The VTS device will be reused to test other participants in the study. At this point, we are not allowed to sell/distribute the device to be used after the study is completed. Small vibro-tactile stimulators applied on a participant’s neck. 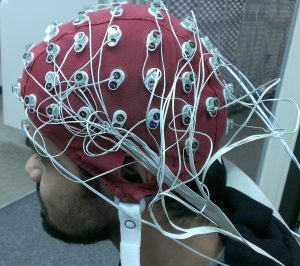 Brain waves will be monitored using electroencephalography.